Staying in tune with the rhythm of the seasons brings harmony, well-being, and inner peace. As I write this post, there is a noticeable “nip” in the air, a change in sunlight, and that familiar feeling of introspection that comes with the shift from summer to autumn. With this shift, comes natural changes in our bodies, moods, and health. Personally, I already feel an extra swing in my step and feel extra tuned into infinite possibilities. Autumn is my favorite season. I absolutely love the coolness in the air, the beauty of the colorful leaves, and the traditional foods that are often associated with autumn, such as pumpkin, butternut squash, and crispy apples. It’s interesting to me how different people resonate with different seasons. Patients often share with me their favorite seasons. I know how I was challenged from the recent humidity here in Santa Monica (something my constitution doesn’t naturally resonate with), while some patients shared how they loved the heat and wished it was hotter! With autumn around the corner, I have begun seeing more patients with lung issues such as fall allergies, colds, and coughing, as well others seeking treatments to assist them through a grieving process or a letting go process. This is typical this time of year, which falls under what Traditional Chinese Medicine considers a “Metal” phase in the 5 elements of nature; where the Lung meridian and Large Intestine channels take center stage. It is also a natural time of year to switch from the more “expansive” spirit of summer (think travel, going out more, and staying up late), to a more “contractive” time conducive to going inward, staying home, and sleeping more. …however, if you’re like most people, you probably don’t sit around thinking about how to adjust your diet, lifestyle, thoughts, exercise, sleep, etc. to harmonize your health with the seasons. It simply isn’t a part of our cultural consciousness anymore. But, despite our lost knowledge here, learning to honor the changing needs of your body within the cycles of the seasons is a powerful way to reduce risk of common seasonal concerns of body, mind, and spirit. In today’s post, you will learn what you can do to strengthen and protect your health during the fall. This fortifying approach will in turn create a reservoir of health to sustain you in the winter months. As mentioned above Traditional Chinese Medicine associates the Lung and Large Intestine channels with autumn. They get special attention because they are also the most vulnerable during this season. The Lung, considered a Yin organ, is associated with taking in the new. The Large Intestine, considered a Yang organ, releases the old. A heightened awareness of these emotions can coincide with the change of season. For example, grief or attachment issues can be associated with the loss of summer which affects some people greatly due to less light and warmth. 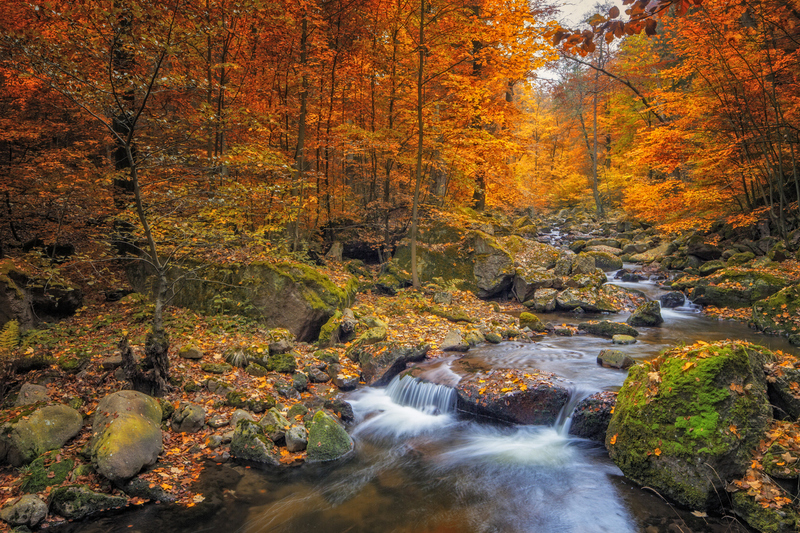 Since fall is a natural time of letting go and getting organized (think of trees dropping their leaves and animals getting organized for hibernation), a lack of awareness in this regard can lead to feelings of stagnation and a lack of harmony with life’s flow. All of which can affect the health of your Lungs and Large Intestine channels. If you notice a feeling of stagnation, prolonged sadness or grief, it may be necessary to consult with your physician and/or integrative mental health professional. All emotions are important and healthy to experience. The concern is more if you are having challenges moving through any emotional expression in a healthy way. Chinese Medicine offers some suggestions for helping to keep the qi flowing in the lung or large intestine which can assist in healthy emotional expression. Your Doctor of Chinese Medicine/Acupuncturist can tailor a treatment specific for your needs while taking into account the energy of the season. You may also want to consider acupressure to help circulate the qi in the lung and large intestine channels. An acupressure point that is well known and versatile is Large Intestine 4, known as Hegu, which translates to “Joining Valley.” It is located on hand on the web in between the in index finger and the thumb. This point is used in Traditional Chinese medicine to strengthen immunity, decrease pain, to help with allergies, cold and flu symptoms, to regulation digestion, and to calm the mind. Recommendation: Press on the point with your thumb. Hold the point as you take 10 full deep breaths, breathing fully into your diaphragm/belly area and exhaling fully. Repeat 9 times on both sides. Recommendation: Sit comfortably. Take a deep breath into your diaphragm/belly. On the exhale, make the sound “SSSSSSSSSSS.” Repeat nine times. The six healing sounds are especially helpful to release stagnation of any kind, including emotional stagnation. Fall offers us the perfect time to let go of those things which no longer serve us. This frees up any stagnant mental and emotional space to embrace those healing feelings of clarity, relaxation, release, focus, happiness, and flow. Breathe—wind is a key element in fall. Therefore, take the time to focus your deep breathing techniques as you become aware of that which needs to be released. Big exhales. Purge—this will be unique to each individual, but if nothing else take the time to purge your closets of unused clothing. Not only will it free up more space, but those clothes will be deeply appreciated by those who need them this winter. Resolve old hurts—what pains or hurt feelings can you release this fall? These unresolved emotions can express themselves as grief and negative self-image, leading to imbalance and illness of the Lungs and Large Intestine. Take advantage of fall’s energy to let old wounds heal. Forgiveness allows us to release what we are holding onto, whether forgiving others or forgiving ourselves. Give—this goes hand-in-hand with purging and resolving old hurts. Give away what you no longer need, and give yourself the gift of release and freedom that comes from forgiveness of self and others. I find a special joy and satisfaction when I get rid of something I no longer use and drop it off at my local Salvation Army or Goodwill. Sleep—if you think about it, the act of sleep is the ultimate way of letting go. Thanks to a special type of lymphatic system in the brain (more on that in an upcoming post) called The Glympathic System, sleep facilitates the cleansing and organization of your brain. To keep things simple, aim to go to bed an hour earlier (the kids too) or, if your schedule permits, wake up an hour later. Your Lungs are particularly vulnerable to winds and extreme temperature changes—both of which are present during the fall. The best solution to both these problems is to dress appropriately for the weather, making sure you layer to avoid getting too hot or too cold. I also recommend wearing a scarf often, even a light, stylish one will protect your Lungs and throat from the harsh winds. In the Traditional Chinese Medicine tradition, the flavor of fall is pungent and should be balanced with sour. This ensures the body’s mucosa stays moist and warm—which prevents infection, without becoming too damp/cold—which causes congestion in the Lungs. Dark, leafy winter greens such as kale, chard, mustard greens, etc. Uncultured dairy products like cold milk, cream, etc. I hope this post has helped you feel more in tune with the season and all of its possibilities. Follow these tips and you can rest easy knowing you have created a reserve of strength, happiness, and health for the fall and winter months to come. Patricia Fitzgerald is a Doctor of Acupuncture and Chinese Medicine, A Licensed and Board-Certified Acupuncturist and Herbalist, and a Certified Clinical Nutritionist. Dr. Fitzgerald is also an international speaker, Founder and Medical Director of the Santa Monica Wellness Center, and the author of the best-selling, award-winning The Detox Solution: The Missing Link to Radiant Health, Abundant Energy, Ideal Weight, and Peace of Mind. You can learn more at patriciafitzgerald.com . Dr. Fitzgerald is also a volunteer with Los Angeles Animal Services and is dedicated to supporting the animal rescue community in matching homeless pets with loving hearts and homes. Her mission is to inspire others to live their passion, while creating and enjoying optimal physical, emotional, and spiritual well-being. “Seek out family members you get along with and spend time with them,” with Dr. Scott West.